Patient had advanced periodontal disease on all of her upper existing teeth. The upper left back teeth were missing. A complete implant supported fixed bridge was made in my office, including placing the implants and bone grafting. Patient’s previous dentist placed two crowns on her upper central incisors. Patient was very unhappy with the result. A new smile was designed by Dr. Chiu. Numerous porcelain restorations and bonding were done to her upper teeth to achieve the new smile. Patient had multiple missing teeth and thin bone structure on the upper left side. The remaining central and lateral incisors were also loose. These teeth were removed and replaced with a fixed implant supported bridge over a span of 8 teeth. All bone grafting and implants were placed and restored by Dr. Chiu. Patient had various broken down teeth due to years of neglect. Her whole mouth was reconstructed using implant supported prosthesis. All work including implants was done by Dr. Chiu. Patient has congenitally missing upper lateral incisors. Her bone anatomy was very thin. All bone grafting, implant placement and restorations were performed by Dr. Chiu in the office. Patient was unhappy with her smile. All upper front teeth were laminated to change her smile. Patient had tetracycline stains on his teeth and many defective restorations. A combination of porcelain crowns, implant restorations, porcelain veneers and whitening were done to enhance his smile. Patient was unhappy with her smile. All upper front teeth were restored with porcelain laminates and porcelain crowns. Patient had extreme wear on his dentition which knocked out his three front teeth on the upper right side. The bite was increased in height on the lower teeth with composite restorations and implant restorations. Later the upper front teeth were restored with implant supported bridge. Patient suffered from severe periodontal disease on all of his upper and lower front teeth. All of the upper and lower front teeth were replaced with dental implants and implant supported crowns. All work was performed by Dr. Chiu. Patient wore down her enamel over the years. The eight upper front teeth were replaced with a combination of porcelain laminates and all porcelain crowns. Patient had braces five years ago. The teeth reverted back to the crowded position, with two teeth forward and two teeth back. A mixture of porcelain crowns and porcelain laminates were made to correct the crowding. 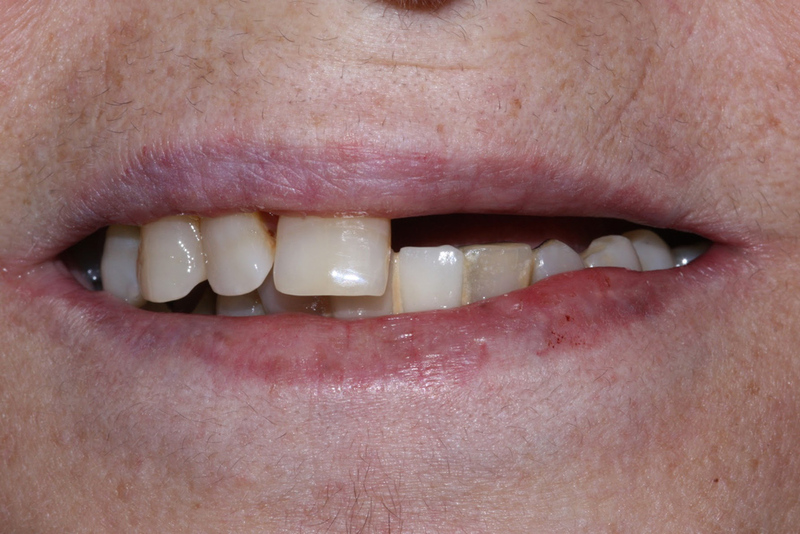 Patient had multiple missing teeth, and the existing teeth were worn and over used. A fixed bridge was made to restore the dentition. Multiple laminates were done to replace old bonding and mal-positioning of patient’s teeth. 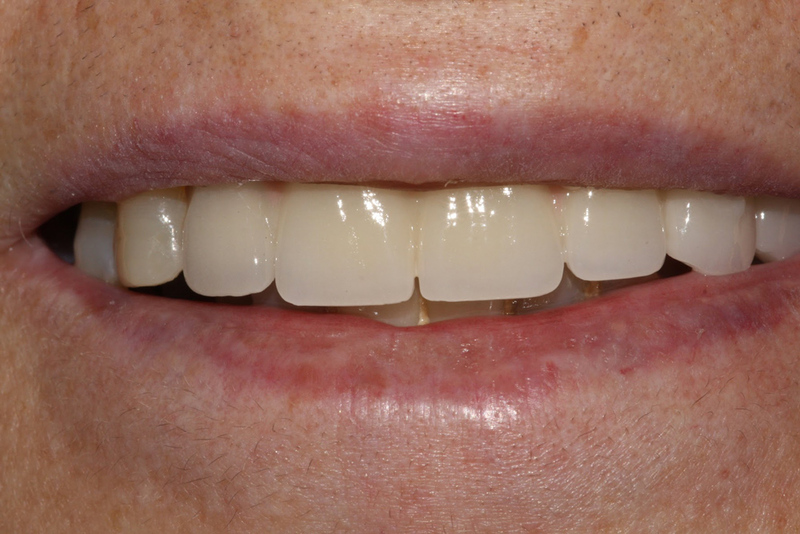 Porcelain restorations were placed to close the space between patient’s central incisors. Patient had misaligned teeth. Four composite laminates were placed on the upper central incisors and the two teeth on the right of the central incisors. The procedure was done in one visit. Patient had severe periodontal diseases which caused the eight front teeth to loosen. She lost these eight teeth. Subsequently, the eight upper and lower front teeth were replaced with implant restorations. Patient had previous braces which failed. Patient was told that she needed surgery and braces again. Two composite laminates were placed on the lateral incisors and composite fillings were done on the canines. Work was completed in one day. Patient was very happy with the smile make-over Dr. Chiu did for her. Patient was not happy with her spaces and chips in her front teeth. The upper front teeth were covered with porcelain laminates. Patient had rampant decay throughout all of her upper and lower teeth. Multiple teeth were extracted. Existing teeth were restored with crowns and bridge work. Missing teeth were restored with implant supported crowns. All surgical and restorative work was performed by Dr. Chiu.